Have you read about it in Chapter 6? You're a Throp, so grab your snowballs and get out on the ice. 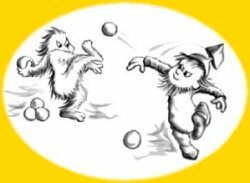 Squallhoots are coming at you - throwing snowballs, swinging icicle clubs... they've even got Googlium Mist! TRY NOT TO GET CLOBBERED!